Why do we wear a poppy during November? Throughout the world the poppy is associated with the remembrance of those who died in order that we may be free, but how many of us are aware of the reason of how and why the poppy became the symbol of remembrance and an integral part of the work of the Royal British Legion? 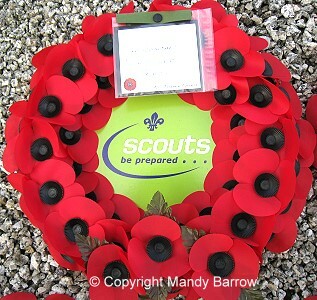 On this page we explain why the poppy is used as the symbol of remembrance. Flanders is the name of the whole western part of Belgium. It saw some of the most concentrated and bloodiest fighting of the First World War. There was complete devastation. Buildings, roads, trees and natural life simply disappeared. 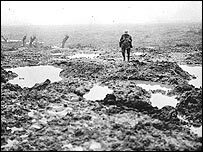 Where once there were homes and farms there was now a sea of mud - a grave for the dead where men still lived and fought. Only one other living thing survived. The poppy flowering each year with the coming of the warm weather, brought life, hope, colour and reassurance to those still fighting. John McCrae, a doctor serving with the Canadian Armed Forces, was so deeply moved by what he saw in northern France that, in 1915 in his pocket book, he scribbled down the poem "In Flanders Fields" . McCrae's poem was eventually published in 'Punch' magazine under the title 'In Flanders Fields'. 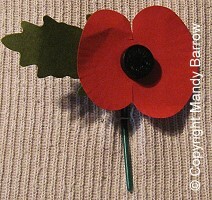 The poppy became a popular symbol for soldiers who died in battle. In 1918, Moira Michael, an American, wrote a poem in reply, 'We shall keep the faith', in which she promised to wear a poppy in honour of our dead. This began the tradition of wearing a poppy in remembrance. Which side should I wear my Poppy? I feel it is more important to wear a poppy rather than worry about which side you should wear it. Some people prefer to wear a poppy on the left over their hearts. However, the general rules is to wear Left for men because that's where medals go and Right for women because that's where a widow would wear her husband's medals. Why do Scottish Remembrance Poppies have no green leaf and English Poppies do? Where does the money raised from selling poppies go? Money raised from the selling of poppies in Scotland goes to the Earl Haig Fund and money raised in the rest of the UK and overseas goes to the Royal British Legion Poppy Appeal Benevolent Fund. The money raised for both is ringfenced for providing welfare to those in need - veterans and their dependants. 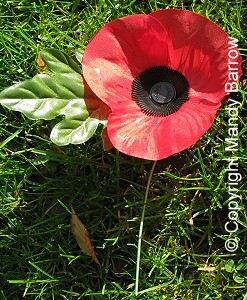 When was the first Poppy Day? 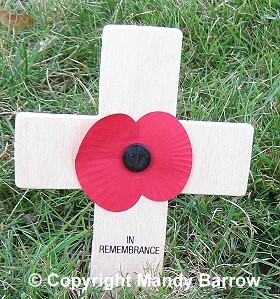 The first actual Poppy Day was held in Britain on November 11th, 1921 and was a national success raising £106,000. Since then, during every November, we keep the memory alive by wearing a poppy to commemorate those who sacrificed their lives during war.